Effective Length: 16 to 22"
The Libec PH-8BL Extendable Pan Handle is compatible with the Libec RHP75, RHP85, and LX10 video heads. Though packaged for immediate installation with a downward-pointing orientation for left-handed use, it can connect and lock onto either side of the heads with a clamp and bolt, for left or right-handed use. A rubberized handle provides a comfortable means to move its telescoping aluminum-alloy shaft, which is effectively adjustable from 16 to 22 inches. 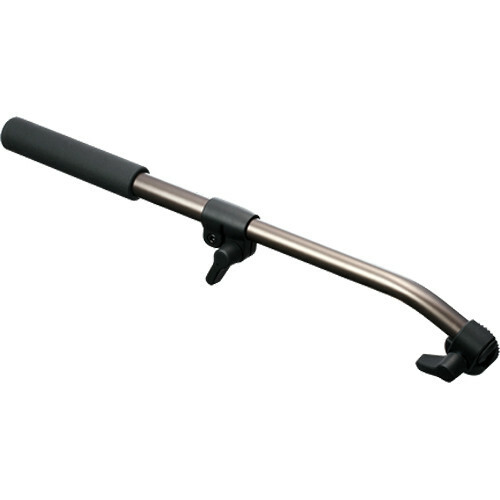 This angled pan bar handle can rotate within its clamp, allowing a downward-pointing orientation. For the right-handed version of the handle for the same Libec video heads, use the PH-8B Extendable Pan Handle instead. Box Dimensions (LxWxH) 13.9 x 1.7 x 1.4"